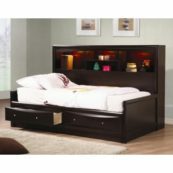 Kids Only Furniture carries largest selection of daybeds Los Angeles. Daybeds are very versatile when it comes to both seating and sleeping space. They are a combination between a couch and a single or double bed. Daybeds are a great addition both in a kid’s room setting or as a comfortable lounge are and even a guest bed. Because daybeds come in either twin or full sizes they can have either a trundle or drawers for convenient storage options. Thus, it is important to choose a quality daybed as it might not only serve as kids furniture but also for your adult guests. 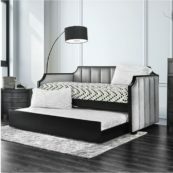 Daybeds can come in variety of styles and finishes. Furthermore, we recommend daybeds that are neutral in both their finish and style so that they can be maximized in any setting.